One of the Inland Northwest's smaller more hometown driven financial institutions is on track to expand their presence with a the recent announcement of a new branch location on the West Plains. Cheney Federal Credit Union has purchase land and will begin construction on a branch location at 10611 W. Westbow Rd, across the road from the Petro Truck Stop and just a quick jaunt southeast of I-90 at the Medical Lake exit. The new location will position CFCU in a area that has seen significant growth in recent years and more convenient to members and prospective members living to the north of main location on W. 1st Ave in Downtown Cheney. The new Westbow Rd. CFCU branch location will be built out by Baker Construction & Development of Spokane with a projected opening date being set for sometime this fall. The new branch will be 2735 square feet and employ about 12. 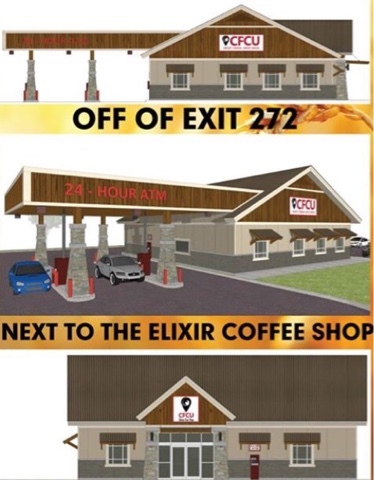 It will also boast 3 drive up teller lanes and two 24 hour ATM's .